■青山弘之編／青山弘之・森晋太郎著『アラビア語文法教本　初･中級』青山弘之、2011年、v + 285 pp. ■Aoyama, Hiroyuki, History Does Not Repeat Itself (Or Does It?! ): The Political Changes in Syria after Hāfiz al-Asad’s Death (MES Series No. 50), Chiba: Institute of Developing Economies-JETRO, March 2001, 116 pp. ■Hiroyuki AOYAMA "Syria: Strong State Versus Social Cleavages," Linda Matar and Ali Kardi, eds. 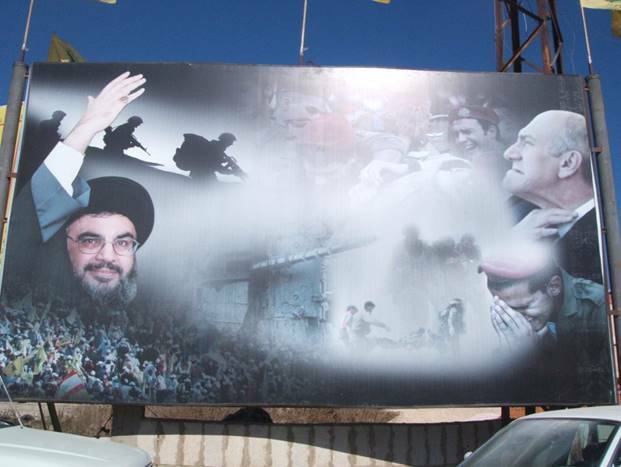 Syria: From National Independence to Proxy War. Cham: Palgrave Macmillan, 2018, pp.71-92. ■Aoyama, Hiroyuki, “Contradiction between Thoughts and Realities in Arab Nationalism: Wahīb al-Ghānim’s Contribution to the Development of the Arab Ba‘th Movement”, Keiko Sakai, ed., Social Protests and Nation-Building in the Middle East and Central Asia (IDE Development Perspective Series No. 1), Chiba: Institute of Developing Economies-JETRO, 2003, pp. 105-121. ■Hiroyuki AOYAMA, Yutaka TAKAOKA, Shingo HAMANAKA, Kohei IMAI, Kota SUECHIKA, Aiko NISHIKIDA, Dai YAMAO and Masaki MIZOBUCHI, “Report of Simple Tally of “Middle East Public Opinion Survey (Syrian Internally Displaced Persons 2018)”” (CMEPS-J Series No. 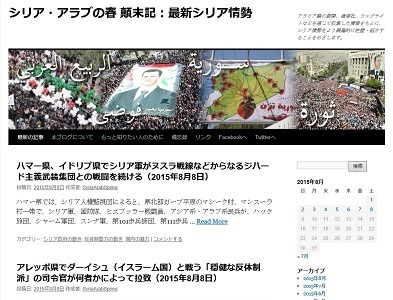 46）, Contemporary Middle East Political Studies in Japan.net (CMEPS-J.net). ■Yutaka Takaoka, Dai Yamao, Shingo Hamanaka, Kota Suechika, Aiko Nishikida and Hiroyuki Aoyama, "Report of Simple Tally of "Middle East Public Opinion Survey (Syria 2017)"" (CMEPS-J Report No. 8), July 3, 2017. 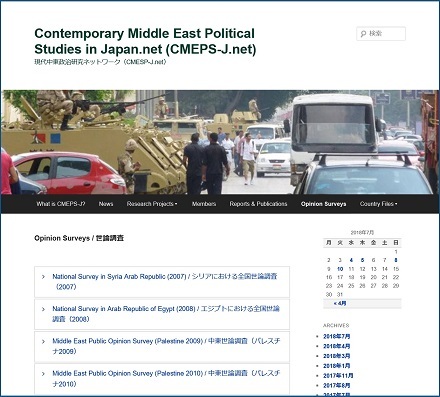 ■AOYAMA Hiroyuki, HAMANAKA Shingo, TAKAOKA Yutaka, SUECHIKA Kota, NISHIKIDA Aiko, YAMAO Dai and MIZOBUCHI Masaki “Report of Simple Tally of “Middle East Public Opinion Survey (Syria 2016)”," Contemporary Middle East Political Studies in Japan.net (CMEPS-J), April 28, 2016. ■Maher al-Charif, “How did the Disappearance of the Religious Reform Have a Part in the Stumble of the Arab Renaissance Projects,?”, Social Movements and Political Dynamism in the Middle East: In the Era of Globalisation (International Workshop Proceedings No. 4), Chiba: IDE-JETRO, 2002, pp. 73-99. ■Aoyama, Hiroyuki, “Contradiction between Thoughts and Realities in Arab Nationalism: Wahīb al-Ghānim’s Contribution to Development of the Arab Baʻth Movement,” An International Symposium of the Islamic Area Studies Project, The Dynamism of Muslim Societies: Toward New Horizons in Islamic Area Studies, Session 5: Social Protests and Nation-Building in Muslim Societies (Kazusa Ark, Kisarazu, Chiba, Japan, October 7, 2001), October 7, 2001（英語による報告）. ■Aoyama, Hiroyuki, “Sheikh al-Buti’s View on ‘Women’s Question’: in the Light of Political Changes in Syria,” 2nd International Symposium of Asian Federation of Middle East Studies Associations & the 6th International Symposium of Korean Association of the Middle East Studies (Myongji University & Capital Hotel, Seoul, Korea, October 17-20, 1997)、October 19, 1997（アラビア語による報告）.